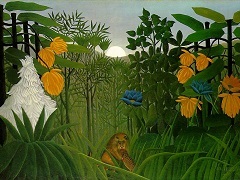 Henri Rousseau is most celebrated as being one of the best naive artists. He was given the nickname la Dounaier (although he never reached this position), which stemmed from a job he held from 1871 to 1893, where he worked with the Paris Customs Office. Prior to this career, he served in the army. During this time, painting was something that he did as a hobby, and in 1893, he accepted early retirement, which allowed him to focus on painting full time. This in turn allowed him to better his from, and create a name for himself in the world of art. Although much of his work was often ridiculed, he did not waiver in the form and style in which he created his art work. 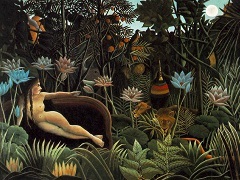 Henri Rousseau tried to paint following an academic manner, where he followed the traditionalist work which was created by some of the top artists in this field. Some of his influences were Bougureau and Gerome. The innocence and charm which he used to create his work, won over the admiration of the avant-garde. And, in 1908, Pablo Picasso held a banquet, to honor Henri Rousseau, and the work he had created. 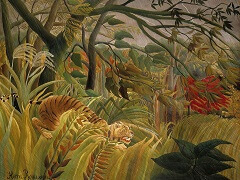 Today, Henri Rousseau is most well known for the jungle themes in which most of the pieces he created took place. Surprised!, is the first of these pieces, which was exhibited in the National Gallery, London, in 1891. 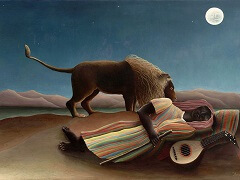 Another piece, The Dream, was exhibited in MOMA, New York, in 1910. These are two prime examples of the creativity of the work he created, and his ability to work on a larger scale, with longevity, and with the attention to detail which he paid in his art forms. Some of the inspiration for the work he created, were visits to zoos, magazines, and the time he spend in Paris. Although Henri Rousseau was labeled under the naives art form, he also created work which many labeled as primitive, and many even classified him as a surrealist, with many of the distinct creations that he put together during his career. He was well known by surrealists, and was in fact a driving force in this movement. His ability to see beyond the eye's reach, and his ability to perceive what was not seen on paper, gave his work extreme depth, and helped him create a diverse set of paintings during his career, each with their own unique style and form. 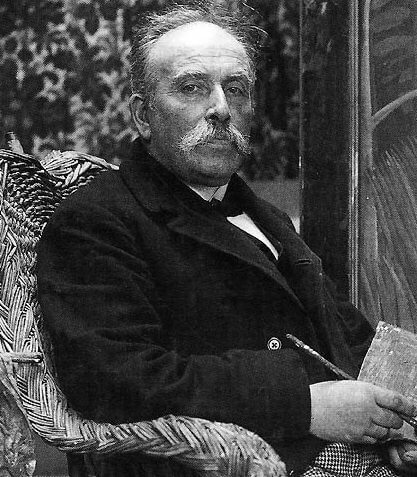 Henri Rousseau believed that his work was done in an academic style, although he was most widely seen as a professional for his creative style, and the unique ability to take something out of the page of a magazine, and recreate it into a unique and distinct picture. He was brought into the lime light in 1908, during the banquet in which Picasso introduced him to the art world. 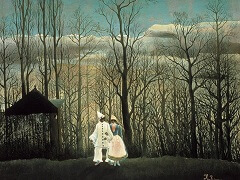 Styliization, the fantastical images, and direct vision, were some of the features which the art world loved, when viewing the images which Henri Rousseau created during his career. Rousseau was not formally trained, and only took up painting as a hobby during his career, but the self confidence which he had in himself, and the sense of entitlement he had in his work, allowed him to create amazing pieces. Most notable the jungle scenes which he worked on, and was most well known for, but he was also known for the dream like work and scenes, which he depicted in many of the later works he did in his career as well. Most of his work was not based on first hand experiences, but on places he had visited, or print ads which he had seen, and reworked a new life, and new style, to create his own distinct style with these pieces which he painted. 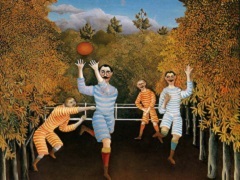 Many of the works which Henri Rousseau created were also extremely disproportionate, and exaggerated. One example of this, was the Boy on the Rocks, which critics claim to be both funny and alarming. Viewers see the rocks as a series of mountains, which are dwarfed by a child trying to overcome this challenge. His vision, his attention to detail, and his inability to distinguish between fantasy and real life in the works which he created, gave much allure to the style, and the pieces which he painted during his career. Much of this was probably due to his lack of formal training in the art world, but also because of the fact that he had a different perception of reality, and of the work which he was producing, when he painted on a large scale canvas, which he often created most of his work on. 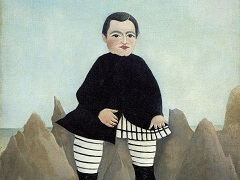 Like most artists, shortly following his death, Henri Rousseau became an extremely well known name in the art world, and his paintings were sought after by collectors, museums, and admirers of his work in general. Much of the work which he created, did not sell during his career, but there was a great demand which occurred shortly after his death. This not only caused an increase in the price of the pieces that were sold, but also created more buzz around his name, his legacy, and the work which he created during an extremely short career he had in the art world. Henri Rousseau took up art as a passion and as a hobby; yet he managed to make his way to the top, and is today known as one of the greatest naive painters to exist. His ability to see into the future, and to create surreal pieces, years before the movement came to be, required some kind of genius. This was probably one reason for his success with other artists (we know Picasso, Henri Matisse, Vincent van Gogh and Marc Chagall were among his first admirers, and Surrealists, such as Max Ernst and Salvador Dali, who admired him thirty years later). But by re-introducing the values of the imaginary into the art of his period, he went beyond one of the needs of his time - and ours. 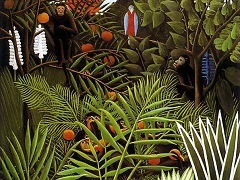 Copyright © 2008 - Present www.HenriRousseau.net. All Rights Reserved.